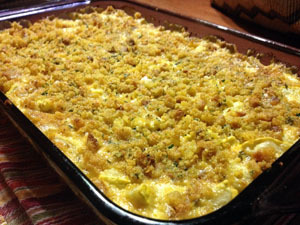 Cook: Squash Casserole | CookDrinkFeast! To call this a squash casserole doesn’t really convey the awesomeness of this dish. Think of an ooey-gooey mac and cheese with squash instead of pasta. I’ve been volunteering in a community garden this spring and summer. If you’ve ever planted squash in a vegetable garden, you know where I’m going with this. 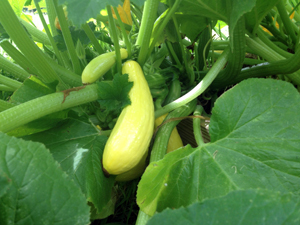 The garden has produced a literal bumper crop of summer squash. So I had a produce bin full of squash that came from the sweat of my brow (Insert back-of-hand-to-forehead gesture here). I was not about to let the fruit (or vegetables) of my labor go to waste. I remembered that one my aunts used to bring a delicious, cheesy squash casserole to family gatherings. I vaguely remembered cheddar cheese and Stove Top stuffing mix. So I went a-Googling and found the recipe I was looking for. But—Horrors! It called for canned cream of mushroom soup! I could let stuffing mix slide, but I could not abide by canned ‘cream of’ soup. Anyhoo—Give it a try and let me know what you think. Melt one tablespoon butter in a large skillet or sauté pan over medium-high heat. Sauté diced mushrooms until soft and golden—about 3-5 minutes. Remove mushrooms from sauté pan and set aside. Combine heavy cream and chicken stock or both in a microwave safe container (I use a big coffee mug). Heat gently at 75% power for a minute to take the chill off—your microwave power may vary. The mixture should feel slightly warm, but not hot to the touch. Melt another tablespoon of butter in the same skillet or sauté pan over medium heat. Sprinkle in flour and stir vigorously with a whisk to make a roux. Once the butter and flour mixture starts to turn golden and smell nutty, whisk in the warmed cream and stock mixture, taking care not to let it boil. Once the mixture is combined and heated through, add sautéed mushrooms and salt and pepper to taste. Remove mixture from pan and set aside. Working in batches, sauté squash and onion in the three tablespoons of butter until the vegetables are soft—about 3-5 minutes—salt and pepper to taste, then remove them to a large mixing bowl. I usually do it in three batches, using one tablespoon of butter per batch. Fold in mushroom mixture and sour cream. Fold in half of cornbread stuffing mix and the shredded cheese with the squash mixture. Add salt and pepper to taste, then spread it in a greased 9 inch by 13 inch glass baking dish. Mix remaining cornbread stuffing with 4 tablespoons of melted butter and spread it over the top of the casserole. Bake in a 350-degree oven for 45 minutes, until golden brown. This is one of my favorite recipes. I figured I should post this again for anyone wondering what to do with all the squash in their garden.